The experienced Baton Rouge, Louisiana burn injury attorneys at Dué Guidry Piedrahita Andrews L.C. 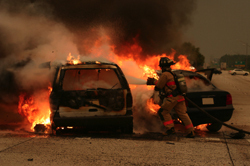 have represented clients with severe burn injuries, including those caused by fireworks, fuel fed fires, natural gas explosions, workplace injuries, industrial plant fires and explosions, boiling liquids, electrical injuries from faulty electric wiring, electrical injuries from commercial and residential power lines, and from defective appliances, including hot-water heaters, a residential microwave, and a commercial deep-fat fryer. Severe burn injuries occur for many different reasons, the most common of which are chemicals, electricity, fire, fireworks, friction, heat, and light. Burn injuries are generally identified by class. First degree burns generally involve the epidermis or outer layer of skin, are like most sun burns and involve limited redness and minor pain. Second degree burns are usually caused by boiling water, involve the superficial dermis, blistering of the skin and pain. Third degree burns involve extreme damage to the epidermis, damage to the deep dermis, and result in scarring and may require skin grafting. Fourth degree burns involve severe damage to the hypodermis and damage to the muscle, tendon and ligament tissue. When not fatal, fourth degree burns require skin grafting. The experienced Louisiana fire accident lawyers and staff at Dué Guidry Piedrahita Andrews L.C. have the compassion and understanding of burn injuries necessary to help you or your family through the devastating, debilitating and disfiguring consequences of burn injuries and the scars, both emotional and physical, that these catastrophic injuries leave behind. Our Louisiana burn injury trial lawyers have collected millions of dollars for burn victims, with multiple clients receiving in excess of $11,000,000 each. Paul H. Dué represented the lead plaintiff in an industrial accident case that resulted in severe burn injuries to two employees and the death of one other employee, and which resulted in a $158,000,000 combined jury verdict in Plaquemine, Louisiana. At the time, this jury verdict was believed to have been the largest personal injury jury verdict in Louisiana history. And, in 2010, Randy A. Piedrahita and Kirk A. Guidry obtained a $11,000,000 jury verdict in St. Landry Parish against a natural gas supplier for burn injuries sustained as a result of a house explosion that occurred after an unauthorized person turned-on the gas at the house meter after the gas had been negligently shut-off by the gas company without the use of a federally compliant locking device, The Opelousas, Louisiana jury verdict was affirmed on May 25, 2011 by the Louisiana Third Circuit Court of Appeal. If you or a loved one sustained serious burn injuries during an accident, contact the experienced Baton Rouge, Louisiana burn injury lawyers at Dué Guidry Piedrahita Andrews L.C. to schedule a FREE CONSULTATION. Kirk A. Guidry recognized as 2019 Best Lawyers® "Lawyer of the Year" in Baton Rouge area. Dué Guidry Piedrahita Andrews L.C. attorney Kirk A. Guidry was recently recognized by his peers in Best Lawyers as the 2019 "Lawyer of the Year"
*All attorneys in the firm are licensed to practice law in Louisiana, and B. Scott Andrews is also licensed to practice law in Texas. We serve the following localities: Caddo Parish, Shreveport, Calcasieu Parish, Lake Charles, East Baton Rouge Parish, Baton Rouge, Lafayette Parish, Lafayette, Lafourche Parish, Thibodaux, Lincoln Parish, Ruston, Livingston Parish, Denham Springs, Orleans Parish, New Orleans, Ouachita Parish, Monroe, West Monroe, Rapides Parish, Alexandria, and Terrebonne Parish.